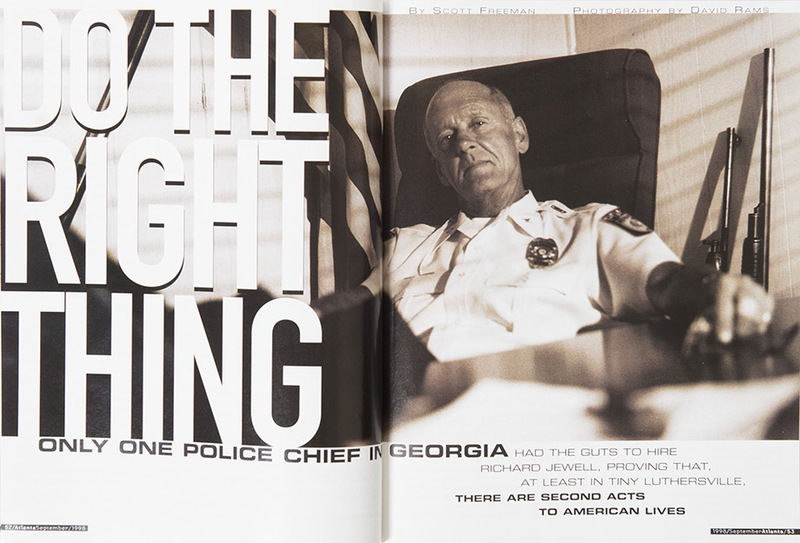 Only one police chief in Georgia had the guts to hire Richard Jewell, proving that, at least in tiny Luthersville, there are second acts to American lives. It was about 11 o’clock on a night when a man and woman burst into the police station with their 5-day-old baby. The infant was gasping for air, already turning a deathly hue of blue. The sergeant took charge. He sat the infant on a desk and quickly figured out it had regurgitated its milk; the bile was blocking its mouth and nose. He had once taken an advanced course in first aid and simply did what he’d been taught to do. He laid the baby on a desk and used his finger to clean the mouth and upper throat. The other officer called an ambulance and brought in a suction cup to clear the infant’s nose. The sergeant quickly turned the baby over and picked it up, cradling the tiny chest in the palm of his hand. He gently tapped the baby’s back, helping it to force out the rest of the congestion. Finally, there was a cough and then a deep breath and the sound of a baby wailing. The ambulance arrived about 15 minutes later. Without the sergeant, it would have been 15 minutes too late. The parents returned the next day to thank the officers, to call them heroes. But that’s a word that makes McNeese uneasy. Especially considering that the cop who took charge and saved the infant’s life was Sgt. Richard Jewell. Right. That Richard Jewell. McNeese likes to quip that Luthersville might as well have a WELCOME TO MAYBERRY sign at the city limits. Situated about 40 miles southwest of Atlanta, traveling to Luthersville is much akin to stepping hack into the 1950s. The closest thing to a traffic signal is a flashing red and yellow caution light in the center of town, and the closest thing to a fast-food place is BubbaDoo’s, a hamburger-and-hot-dog joint/convenience store. Luthersville is one of those rare places still unspoiled by progress, although development from neighboring Coweta County is inching closer and closer. The area has a spacious feel, with rolling green lawns and century-old hardwoods shading stylish well-kept Victorians, the kind of whitewashed wood-frames with large front porches that your grandparents lived in. Until McNeese’s arrival, the police department itself was the major source of trouble in Luthersville. The town had the reputation as Georgia’s most notorious speed trap. Officers were known to spot an elderly person behind the wheel and get on their back bumper, hoping to make them nervous until they crossed the centerline or forgot to use a turn signal. Then, they would be pulled over and ticketed. Roadblocks were customary every Friday and Saturday night. The former police chief made no bones about it. “I like the name speed trap because people drive slower,” boasted then Chief Dorsey Evans. In the spring of 1995 the state attorney general’s office seized all of the town’s traffic court records and launched an investigation—many of the driving convictions were going unreported to the state, and the town also went four years without sending the state its share of money collected in traffic fines. When investigators went to get the traffic court records, they discovered more than 30 grams of marijuana sitting in an unlocked file cabinet in the chief’s office; Evans told an investigator that it had been left there by a predecessor. Evans resigned five months later, saying he was tired of feuding with the mayor. Then, last year, the former chief was arrested by the Fayette County Sheriff ‘s Department as a suspect in a multistate bank fraud, accused of manufacturing false identification cards to open fraudulent checking accounts in at least four Southern states. However, the grand jury did not indict him. In September 1997, Luthersville turned to Paige McNeese to clean up its police department. He landed a job with the Vidalia Police Department, stayed there 10 years and eventually went to Marshallville—a little town just south of Macon—as police chief. After three years, he tired of the grind and decided to get out of law enforcement. “As a chief, you sometimes kind of think that there are all these people out there laying awake at night trying to figure out ways to screw up your day,” he says. McNeese was going to take a year off, maybe go out to Colorado and ramble around, do some private detective work on the side. Within three months he was bored stiff. McNeese heard about the opening in Luthersville and took the job. He found a department in complete disarray. There were two police cruisers, the newest a re-built 1994 model. There was no spare tire and no jack. There were two shotguns and one shell for each. Officers were making six bucks an hour and, of course, there was the speed trap business. A thin, wiry man with steel-blue eyes and a graying close-cropped haircut that reflects his days in the Marines, Paige McNeese might have been played by Lee Marvin in a movie. He’s rugged and tough. A straight talker. Looks a person in the eye. Came into Luthersville on a 90-day contract to clean up the department and, two years later, he’s still there. He’s also the only police chief in the state of Georgia willing to give Richard Jewell a job. Never mind that Jewell was guilty of nothing. Never mind that he was the security guard responsible for saving maybe dozens of lives in Centennial Olympic Park during the 1996 Olympic Games when he spotted a suspicious backpack under a bench that turned out to be a bomb and started clearing people away before it exploded. And never mind that, in retrospect, it’s difficult to even understand why the FBI ever targeted Jewell other than the pressure to finger somebody as a suspect fast so they could reassure the entire world that things at the Olympic Games were firmly under control. After Jewell was finally cleared, both NBC and CNN reached settlements with him and Time magazine published a clarification. The AJC refused to back down and Jewell filed a lawsuit that quickly evolved into a bitter court fight. After Jewell saved the 5 day-old infant’s life, the AJC published a one-paragraph story on Page 12 of the E Section. And even then the paper inserted qualifiers such as “being credited with” and “reportedly,” as if the whole episode was cloaked in doubt. It was either an accident or fate, take your pick. But one afternoon McNeese phoned in an order to the company that sells ticket books to the department. The lady took his order, then asked if there was anything else he needed. “Yes, there is; could you send me two police officers?” he joked. McNeese would find out later that the woman went to the same church as Jewell’s mother. Even in the midst of the media frenzy, McNeese never thought Jewell planted any bomb. It just didn’t make sense to him. And his meeting with Jewell only reinforced his intuition. “Before I got into policing, I was the vice president of a bank. I’d been in banking ever since I’d left the Marine Corps. And you learn an awful lot in that. Ninety percent of the time, a banker or a loan officer knows whether he’s going to lend somebody the money or not before he even does the background check. You learn to read people. And I was impressed with Richard. McNeese told Mayor Albert Gill and a couple of city council members about his new hire. Gill simply said it was McNeese’s decision to make. Besides, the town had been looking for officers for two months without luck; the $8.50-an-hour starting salary was hardly a drawing card. But one of the council members was openly skeptical, and told McNeese that she thought the chief was opening himself up to a lot of criticism. Jewell called McNeese early that Tuesday morning. The next day, for the first time since the nightmare of the 1996 Olympic Games, he was wearing a uniform. About a month later, the councilwoman came up to McNeese. “Chief,” she said. After he hired Richard Jewell, the calls and letters began coming in from Germany, Australia, Switzerland, New Zealand, all over the world. McNeese also heard about it at the local coffee shop. He expected a little flack, but virtually all the reaction was positive. People were generally glad that somebody had finally given Jewell a break. Jewell has received more than one double take from those he encounters as an officer. People he’s never met call him Richard, as though they’ve known him all their lives. One afternoon, McNeese received a phone call from someone about a 16-year-old kid who’d been pulled over for a traffic violation. The chief braced for a complaint. Instead, he was told the officer was very courteous and issued a warning, explaining what the kid was doing wrong and what the consequences could have been. The kid didn’t notice the signature on the warning ticket until he got home and placed the name with the face, realizing it was that Richard Jewell. The ticket is now matted and framed and hanging on the kid’s bedroom wall. The chief also has little patience for those who make snide remarks. Like the time someone called McNeese wanting to know why his “damned bomber” had given her a ticket. And, sometimes, somebody will call Jewell “the bomber” to his face. It doesn’t happen often but when it does, McNeese will usually call Jewell to the station and invite him to watch television for a while or to patrol some of the back roads, just to get it off his mind. Other times, they’ll talk for a while and McNeese will keep reminding him that he has to take into account what kind of person would say something like that. Actually, the 5-day-old baby wasn’t the first child in Luthersville rescued by Richard Jewell. A few weeks before that, a 5-year-old girl drank some bleach. Jewell knew that milk was a recommended antidote; he went to the store and bought a quart, then took it to the child and coaxed her into drinking it while they waited for an ambulance. One afternoon over the telephone, McNeese is talking with a reporter about the incidents when Jewell walks in. “Here, let Richard tell you him self,” says McNeese. Jewell doesn’t give interviews these days but when his chief hands him the phone, he feels obliged and begins hesitantly talking about the 5-day-old child he saved. Richard Jewell never asked for his celebrity. He’s never enjoyed his celebrity. It’s most likely he never will. And he’s right: He was just some guy in the right place at both the exact right time and the absolute wrong time. Paige McNeese will tell you that he thinks Richard Jewell has finally found a home in Luthersville. He’s already been approached by bigger departments and turned them down, although Watson Bryant says that Jewell will probably someday take a job nearer Atlanta so that he can be closer to his mother. Luthersville; he brought it into his office and hasn’t had time to use it since. The shotgun he bought when he was 18 years old. The rifle is a Remington 30.06. Contributing editor Scott Freeman’s previous Atlanta Magazine story on Richard Jewell, in 1996, won a City and Regional Magazine Association Award. He is at work on a biography of Otis Redding for St. Martin’s Press. This article originally appeared in our September 1998 issue.